HOWTOONS returns with an all-new sci-fi DIY adventure! Celine and Tuck's parents put them to sleep for centuries to ride out the energy crisis—but when they awake in the far future and Mom and Dad are missing, it's the kids who have to save the day! Celine and Tuck must explore a strange new Earth using their gadgeteering skills to create projects and experiments to survive hostile tribes and bizarre mechanized threats—projects and experiments kids and parents can make themselves at home, and learn basic energy literacy at the same time! 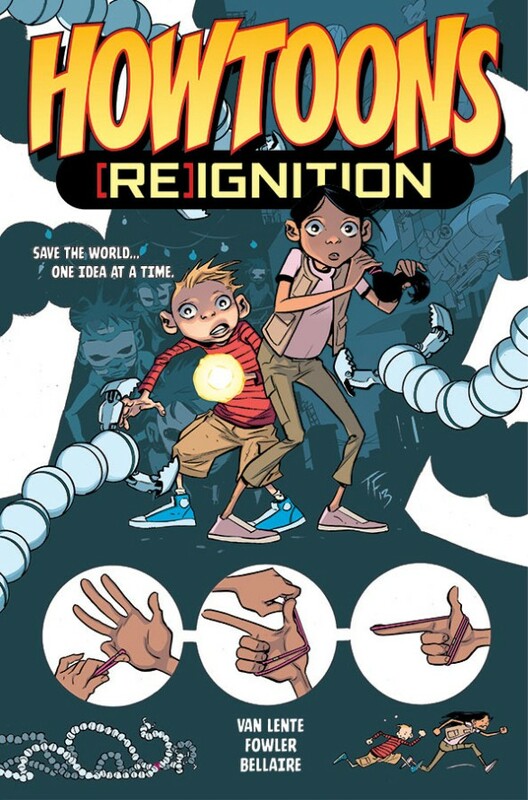 Collects HOWTOONS: [RE] IGNITION #1-5 plus backup strips/projects by series originators EAST OF WEST artist NICK DRAGOTTA and MacArthur Grant winner SAUL GRIFFITH.